Across the four major U.S. regions (as determined by the Census Bureau), there are correlations between the share of the general public affiliated with certain religious groups and the percentage of members of the House and Senate with the same affiliation, a new Pew Research Center analysis finds. And in some cases where a region has a clear majority or a larger-than-average share belonging to one group, the result is an even larger share of members of that group in Congress. For instance, the South has the highest percentage of self-identified Christians in the general population (78%) compared with the Northeast, Midwest and West. The South also has the highest share of Christians serving in Congress (96%). The same holds true among Protestants: The South has the highest percentage of Protestants in the general population (61%) and in Congress (76%). In the Northeast, there are relatively few Protestants among members of Congress (33%) as well as the general population (35%). The Northeast has a higher percentage of Roman Catholics (32%) than any other region, and also has by far the biggest share of Catholic members of Congress (57%). In addition, the Northeast has the highest percentage of Jews in the general population (4%) as well as in Congress (9%). 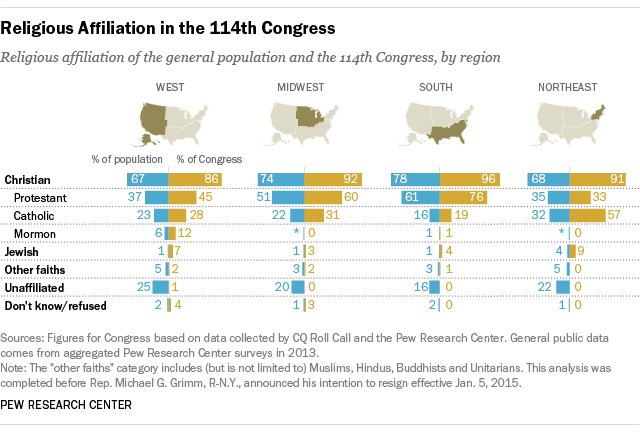 In a few cases, the correlation between the religion of those in Congress and their constituents is less clear. For example, the West, like the Northeast, has a relatively high percentage of Jewish members of Congress (7%). However, the percentage of Jews among the West’s general population (1%) is similar to that of the South and Midwest, which have smaller Jewish contingents in Congress. The only member of Congress who publicly identifies as religiously unaffiliated (Rep. Kyrsten Sinema, D-Ariz.) is also from the West, home to the highest percentage of religious “nones” of any region (25%). But throughout the country, the unaffiliated are the group with the biggest discrepancy between the general public and Congress. “Nones” make up more than 15% of each region’s population, but three of the four regions do not have a single religiously unaffiliated member in Congress. Although identifying as religiously unaffiliated does not necessarily mean one is atheist, politicians may be wary about such an association. About half of Americans (53%) say they would be less likely to support an atheist for president.